I have been forecasting for years that NOAA and NASA would get to a point where they no longer have any interest in pretending to be truthful, and just make up a narrative as they go along. We have arrived at that point. They know that they can say whatever they want, and most people will believe them. Temperatures are actually very similar to February, 1998. And half of the NOAA land data is just made up. They ignored the fact that Antarctica is running cold. 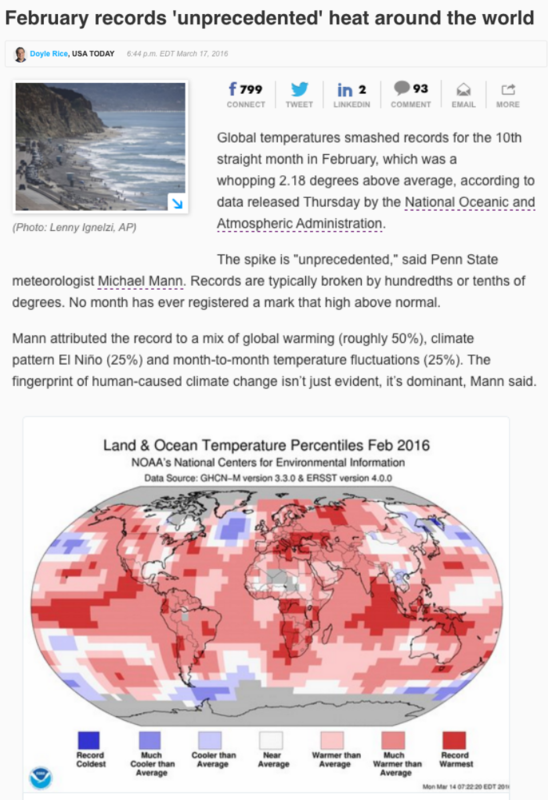 Mikey claims that it was 50% due to Mann-made global warming, which if it were true we would never have another anomaly less than 1.09 degrees. And that may well be the plan at NOAA. The whole AGW scam is politics. I find Omanuel has some interesting things to say. You don’t have to read it. As an engineer you might find his links rather interesting. I am not saying that you will necessarily agree with what he is pointing to, I don’t, but it is a very interesting alternative view of physics. The reason I don’t agree is because I don’t really understand it all, perhaps you would and so could deconstruct what Omanuel says. He is a very polite and detailed respondent and Steven very kindly allows him this space to say what he does. Alternatively , as he labels his contributions, you could just go straight past his comments and so avoid any irritation you might feel. Keitho, some of us are fond of Oliver but object to his clumsy method. Cato the Elder famously ended many of his Senate speeches with stating his fundamental position on Carthage. Now, imagine that instead he would have risen as the first speaker every time a new subject was brought up, said “Carthago delenda est” and sat down. I don’t think history would treat him kindly. Comment first on the actual subjects of Steven Goddard’s posts but finish the comments with his customary “Ceterum autem censeo …”. He could even have a “Ferrum Sole”hyperlink under the phrase. How do they infill the missing data? 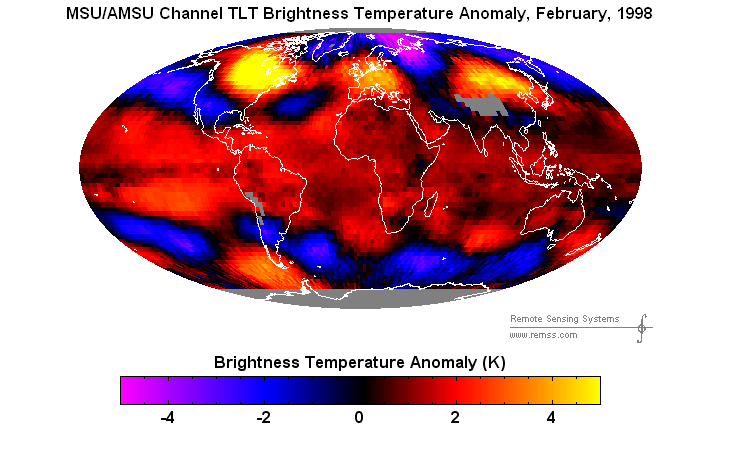 Do they ever mix satellite data in with surface temps data? NASA uses no Satellite data. None. Yes, it ironic. You mean almost all of Africa has no data? Almost all of Canada? All of Antarctica? This isn’t the Stone Age for Heaven’s sake! Billions for climate study, but no one has a few dollars to maintain a decent temperature record? For a sense of scale it’s also useful to overlay a known area, e.g. the USA, over Africa, for example. It’s like taking a temperature in San Francisco and Washington, DC, and interpolating from it what it’s like in Minneapolis. Hey Mr Grass, desertification didn’t work out too well – Google “Greening of the Sahel”. Overpopulation? A bust. Pollution is still a problem but nothing like it was; and unfortunately it’s still bad in China and other commie lands. So what exactly was your point Mr. Grass? Ah yes, Desertification. As a climatology student, in between the global cooling scare and the great global warming swindle, I wrote a paper on Desertification. It was all the rage, in climatology circles. Of course back then, in order to do research one had to go to this thing called a “library” and check out “books”, as Al Gore had not yet invented the internet. Every source I could find, almost exclusively university and government research, said that the deserts would continue expanding at an ever faster rate, and that if we did not spend the world’s treasure on mitigation immediately, we would all die in a sea of sand. So that was basically the conclusion of my paper, and boy did I learn a lesson. I should have known better considering that I had already spent over 5 years as a geology student by then. The only country with a well set up, evenly spaced, with minimal local change effects is America since 2005. Just making up the data instead of bothering to measure it will be very cost-effective for NASA and NOAA. It will save them a lot of time too and get the propaganda out that much faster.. They know that they can say whatever they want, and most people will believe them. Especially the so-called Main Stream Media. Despite all the inconsistencies & blatant Global Warming fraud ; it’s still surprising that people haven’t progressed in the area of assessment & due diligence. Perhaps, modern education has made people more robotic and compliant ; being both tribal & not questioning a hierarchy. Even for those that discover that they’ve been following the wrong team ; it takes integrity to admit one was wrong, all along – a point where most warmists find themselves today. The tipping point is where a lie is said often enough ; people will believe it. We are at the juncture where some alarmists accept anything fed to them. “Being like sheep” was less likely to exist in the 1960’s / 70’s with free thinking & challenging authority. I would go so far as to state “we’ve gone backwards” as a Society,, even Politics has suffered for it..! There are righteous people out there ; but we first must sweep & take out the trash.! If you compare the NOAA chart (top) with the MSU graph (third) you can see several patches of discrepancy.. Always warmer in the NOAA graph than the MSU graph would seem to indicate..
1. Just off the coast of S. America. I live in the SE USA. My own life experience confirms the MSU graph. It is cooler here, overall, than it was in the 1930s. For the century 1901 to 2000, there was little overall change. Warm upswing to about 1940 and a seesaw cooling since. Have there been warm and cool spells? Yes, but all of the coldest temperatures that I remember happened after 1970, with most of them in the 1980s/90s. The coldest mid-March that I recall was the Blizzard of 1993. We had thunder-snow in the part of the state that I lived in at the time and there was a foot plus of snow from Birmingham to Atlanta with 2+ feet recorded north/northeastward from the two cities. I also recall a late May, 1974, where the lowest temperature was 34F. Yep, it almost froze but there was no frost because it was windy. I rode my bike to my high school in it. :). Saw this somewhere.. forgot to get attribution. “What is all the fuss about? In terms of actual temperatures instead of anomalies, July 2015 was way warmer than February 2016. 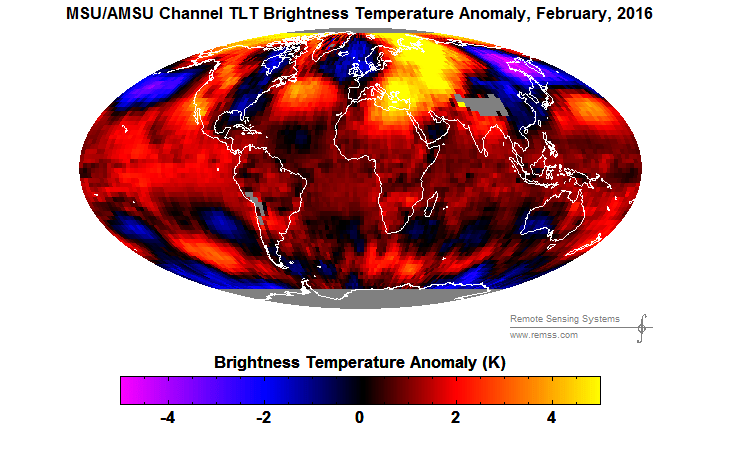 According to NOAA, the average global temperature for July is 15.8 C and for February it is 12.1 C.
If we apply the GISS anomalies to these numbers, then the global July temperature was 15.8 + 0.73 = 16.5 C. And if we apply the GISS anomalies to these numbers, then the global February temperature was 12.1 + 1.35 = 13.5 C. So February was 3 C colder than July! Since we did not fry in July, why should we fry now? Furthermore, most of the anomalous warmth in February was in the far north where the air is very cold with a low absolute humidity. It takes very little energy to warm this air up.